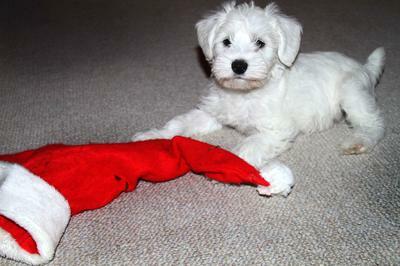 So how does this wife and mother running a household of 4 teenage boys and 2 female schnauzers come to actually agree that a puppy for Christmas would be a great idea? To be honest I'm not sure. 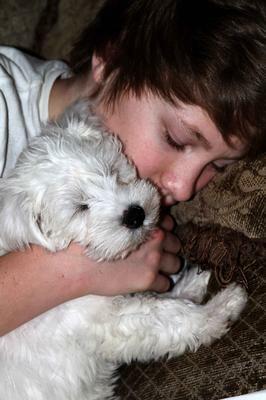 In the beginning of December, after dinner one evening, my youngest son searched for schnauzer pup images. As soon as they appeared on the computer screen, I knew we needed another one - the older two are 9 years old now. 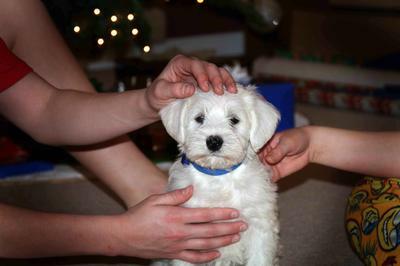 I thought it would be wonderful to fetch a puppy in time for Christmas and better still, a white puppy!! After having 2 disappointing phone calls that led us no further in our search, we emailed a farm in West Virginia. The breeder and I started to call her white female 4 week old "Sugar Cookie" and she was available for Christmas pick up!! Looking forward to Christmas this year felt like being a kid again. I mentioned to the boys that we were getting a puppy as a Christmas present but then lied and said she wouldn't be ready for pick up until mid January. I wanted to save some piece of the surprise element for Christmas. Finally, December 23rd had arrived an my husband and one son, told of the pick up just hours before, made the 6 hour trek to West Virginia. She arrived at our house after 10pm that night and was placed under the tree. This picture captures the moments after she is welcomed. The four arms reaching out to her are, indeed, our four sons petting her in admiration. We have named her Lily Noel. She has been a particular delight to me and I'm sure you can guess that I call her my little girl. 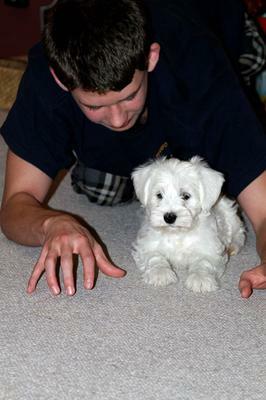 Now 7 months, this white mini schnauzer is quite the beauty and quite the charmer. And she still stops what she is doing to pose for the camera. Lily Noel is such a cutie-pie! 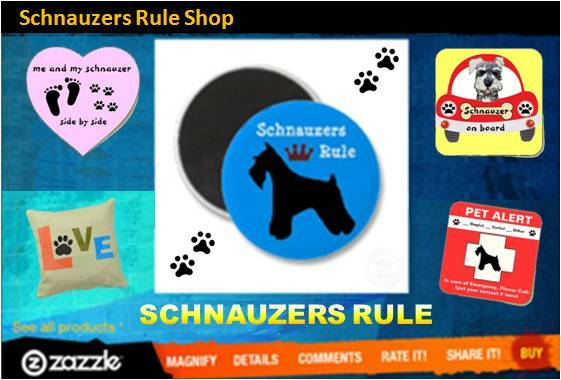 Schanuzers are the BEST dogs! We love our Charlie-boy (5 y/o) to pieces! Aweeee... i love her... She looks sooo cute..